Game of Trains* is a small box card game from Latvian publisher Brain Games. The box says it’s for ages eight-plus and lasts around 20 minutes, which is about right – although 30 minutes is more likely with more players. The game accommodates two to four players and works well at all player counts, with no changes to the rules. The game is suitable for gamers and non-gamers alike, although to play well you need to very aware of what’s going on with other players’ cards – so there’s more brain work with more players. 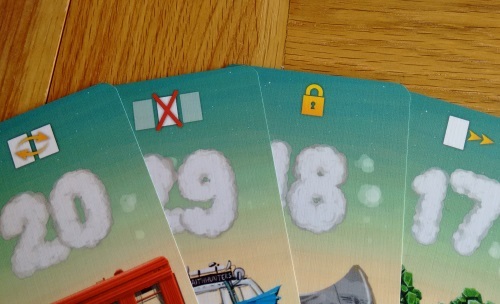 The train theme is totally pasted on: this is a purely abstract card game that could just as easily been a boring deck of cards numbered 1-84 (along with the action symbols). But the artwork on the cards is fantastic and really brings a discovery aspect to the first few games you play; and later games with new players. The cards are very high quality (linen finish) and the rules very simple to follow. The game retails for £10 or a little less, which is pretty much the standard price for double-deck sized card games – so no complaints there either. The rules of Game of Trains are very simple and really can be explained in five minutes. Better still there is no hand of cards – everything is face up on the table – so players can ask questions at any time without fearing they’re giving something away. Each player is initially dealt seven random cards which they lay in row in front of them in descending order. The winner of the game will be the first player to have manipulated these cards – by replacing them and using actions – into ascending order. On their turn, a player chooses one of two options: draw a card or use an available action. If you ‘draw’ you take the top card from the shared face-down card stack and replace any one of your cards with the drawn one. The card you replace is then place face-up in the central area and can be used by another player for its associated action – unless it is the same as an action card already available, in which case both cards are discarded. To use a card for its action you simply take it from the centre, do the action, then place the card on the discard pile. There are eight different actions on the cards but this isn’t as overwhelming as it sounds and the iconography is very simple: four of the actions (with arrows) let you rearrange cards in your own line; while the other four (crossed out cards or locks) force all players, including yourself, to discard a card from a certain position in your line – or prevent that from happening to a particular card. As mentioned above, play continues clockwise around the table in this way until one player has reversed their line – at which point they immediately win the game. The writer: German publishers take note: this is a fantastic example of card art and iconography drawing players into a game – before the clever mechanisms start to do their work on the perception of the game. This extra bit of personality gets players on-board straight away so that once the game really clicks, they’re hooked. And better still they remember the game because of it – it has both gameplay and personality, which has led to it being requested for replays several times already. The thinker: What at first seems a rather trivial card-shifting exercise takes on a different hue once you start to consider action discarding – which for me sets Game of Trains apart as a very intelligent filler. As the game moves on you start to notice which particular actions will really help your opponents, giving your decisions an extra dimension: you may use an action just to stop another player profiting more, or not discard a card you really want to so as not to give them the action on it – or discard a card deliberately to clear an action from the central space as a duplicate. These emergent strategies make this fun game into a great one for its length. The trasher: Alongside the great art, this game can really get some table talk going and is full of jerk move potential. Forcing all players to discard a card is brutal and can happen a lot on the early game, leaving you to think the game will go on forever as you keep dicking each other over and laughing at the cards you redraw. But the game really does last 20-30 minutes and always seems to be super close between a couple of often all of the players, leading to some exciting conclusions. There’s nothing like having a card stuck between a 44 and a 47 – and drawing the 46 for a fluky win! Sure it’s random, but the game is so short you just go again – and you must’ve played well to get you within one card of winning. The dabbler: The low barrier to entry in this game is a real plus point, along with the art, and it’s a fun game I enjoyed playing. However, I would give one note of caution. Near the end of the game you’ll find several players are likely to need one particular action to get them the win – so if you’re not paying attention to the whole table (especially in bad light, or with four players) its possible for one bad action card lay to give another player the game. Especially with a mix of younger, sensitive players and perhaps more win-hungry and boisterous ones, this could lead to some bad feeling and an awkward, unsatisfying end to the game. When talking about this kind of game the phrase ‘luck of the draw’ inevitably rear its head for some. 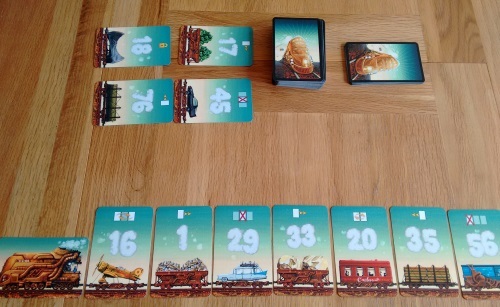 In defence of Game of Trains I’ve only seen one of my games so far (I’ve played six to date, across all player counts) end with a lucky draw – and that felt like a fun ending. Yes, luck of the draw is a factor – I’m not suggesting this is a game of pure skill. But as with all the great filler card games people say are all luck (6 Nimmt! is a great example), you’ll start to notice that good players will win (or place highly) more often than they would in a totally random card game. It really is deeper than it looks. That said, it isn’t deep… It’s an interesting game which can throw up some interesting decisions, but if you’re looking for a small box strategy game this definitely isn’t it. Think traditional family card game and you’re on the right track – so it certainly isn’t for everyone. The ‘take that’ cards that force everyone to discard can be seen as very negative and will put some people off: if this sounds like it will really annoy you, Game of Trains is probably worth a pass. But I would reiterate that even though this is negative play the game does advance without it – and more plays will see you deal with this in other ways. For example, only three of your seven spaces are vulnerable – so if you get a great card you can place it in the spot next to where you want it in a safe spot and move it later. I really was pleasantly surprised by Game of Trains. The art drew me in, the simple gameplay made me think “excellent, another good, clever little gateway game” – then the emergent play took it to a slightly higher level. People often talk about playing back-to-back games of this kind of shorter game but in my experience that doesn’t actually happen – especially when you have a lot of games to choose from. But with this is has already happened twice, which is a very positive sign. What’s a shame is seeing comments by players saying they’ve given it one go and not seen anything in it – a shame, as I think you need a few plays, or a play with a more experienced player, to start to see the game’s hidden depths. Sure, you still might not like it and I’m not suggesting it’s the new Go – but at least they’d have seen the whole game. I hope this review will at least encourage a few people to give it a second chance – and convince anyone who like traditional card games to check it out. * I would like to thank Brain Games for providing a copy of the game for review.